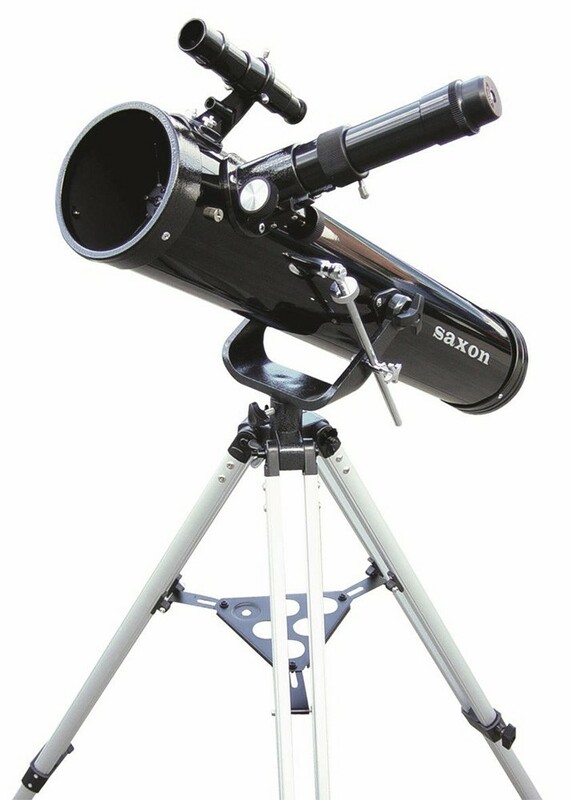 The Saxon F767AZ Reflector Telescope looks like a simple set up, but contains all the powerful optical elements you'll ever need to be introduced to the world of Astronomy. Are you ready to make exciting discoveries of deep skies above? The F767 comes packaged with everything to get you started! The path to astrononmy is a deep and long one and taking the first step may be intimidating, so Saxon decided to make the Saxon F767 AZ Newtonian Reflector Telescope to ease your fears and take you on an extra journey of personal astronomical discoveries! As a telescope that comes with a tripod, filter, eypieces and the right optical elements, it as all the tool as budding astronomer needs! Packed with a 76mm aperture, 700mm focal length, this is a basic reflector using a Newtonian mirror system. This optical system means your views are free of chromatic aberration and is less expensive to make for any given objective diameter than comparable quality scopes of other systems. Together with this scope you also get an aluminium tripod, three 1.25" eyepieces (4mm, 12.5mm and 25mm) giving you a broad range of magnifications and a 5x24 finderscope, 1.5x erecting eyepieces for terrestrial viewing, 1.25" Moon filter reduces and/or modifies intensity of all wavelengths or colors of light equally. 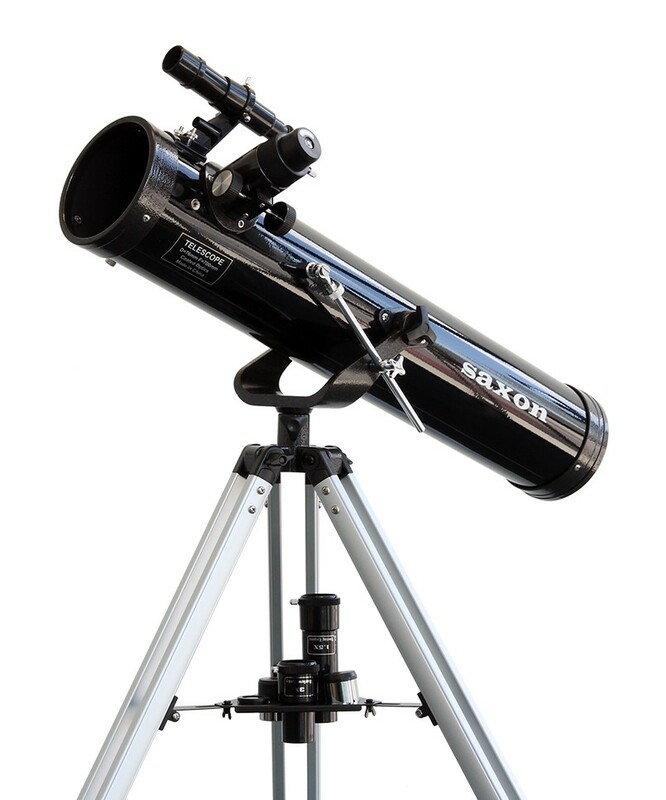 The Saxon F767 AZ Newtonian Reflector Telescope has 18% more light gathering power than a 70mm, enough to allow simple study of the Moon, planets, star clusters and brighter nebulas. This is probably the most reasonably priced reflector on the market. 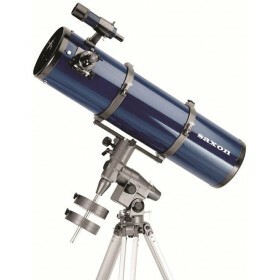 Your Saxon F767AZ Telescope is covered by a 5-year limited warranty by Saxon. See Bill's blog about what you can see with a saxon 767 telescope. 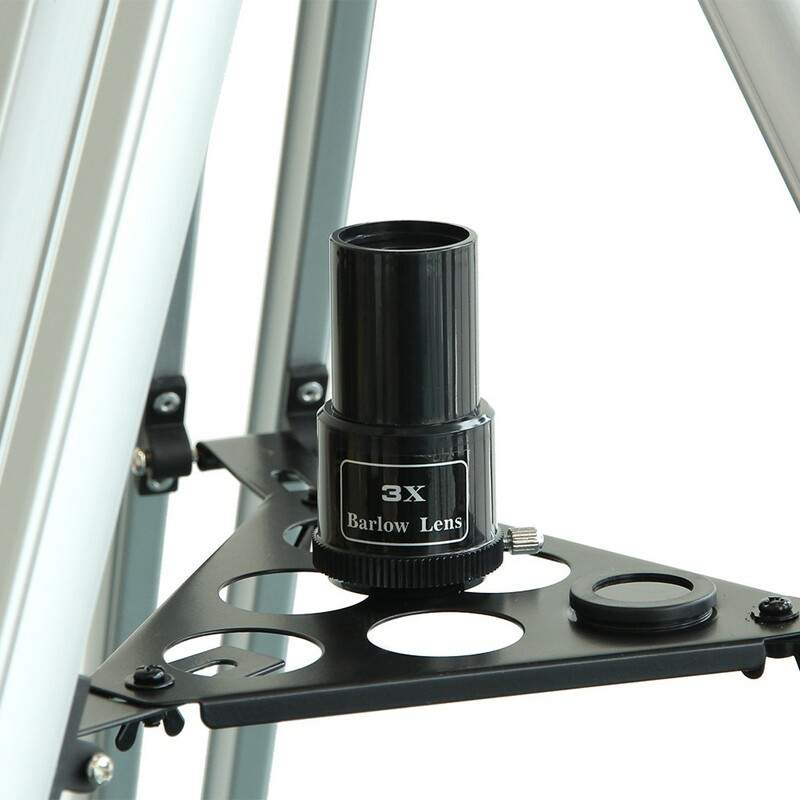 This telescope is easy to set up with no tools needed other than the included flat metal piece that can be used as a screwdriver. Once set up this an easy to use beginner's telescope which is powerful enough to view some details of Jupiter, as well as impressive views of the moon. The included accessories are good quality for the price, and provide a good range of magnification levels. Not listed on this page, but worth mentioning is the package also includes a couple of small posters on the moon and the solar system to give you some information on these to help you get started. I bought this scope this afternoon and assembled it in the evening, without reading the instructions. It was easy. The rain had stopped, the clouds were clearing and the moon was out, and very bright, so despite the cold and damp, I decided to check out the telescope and several of the accessories in the package. With the tripod legs retracted, the scope was easy to move thru the house and onto the driveway. I extended the legs and placed the telescopeand mount facing the moon. The moon was easily located with the 25mm eye piece, without having to use the 5x24 finderscope. As expected, the moon was too bright, the moon filter soon fixed that. The moon was clear and sharp, and took up nearly the full image circle with the 25mm eyepiece. With the 12.5mm eyepiece, only see about 2/3rds of the moon was visible, but it gave great views of the craters and the "moon pole". The 4mm eyepiece gave very detailed views and the "moon rim" seemed like a "distant mountainous horizon". All 3 eyepieces gave clear, sharp views of the moon. The plastic containers for each eyepiece are very handy. I used the 25mm eyepiece and the moon glow filter with 1.5x erecting extension and 3x barlow. This simulated 16.7mm and 8.3mm eyepieces, respectively. Both gave clear and sharp views. The 1.5x erecting extension, the 3x barlow and the 5 x24 finderscope, all worked as expected. I bought this telescope as I was going skiing over the weekend and wanted something to keep everyone entertained at night. 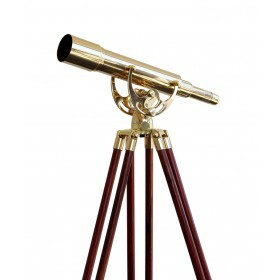 I remembered the sky was always amazing up there and wanted a telescope. 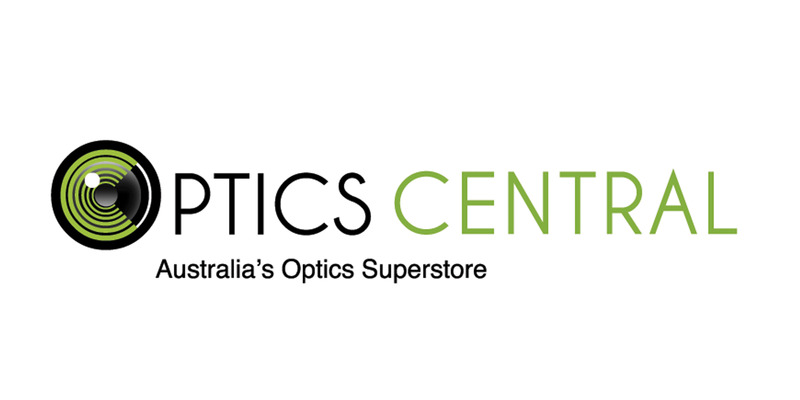 I googled Telescopes and found OpticsCentral and decided to give them a call. Told them what I wanted and said I don't want to spend alot of money, preferably less than $200 and they recommended this. The telescope arrived next day. We brought it up with us that weekend and had a blast. The moon looked great with the filter and we could see all the craters. Great Product and this price. Now my kids want a bigger Telescope Review by Peter M.
I bought this telescope for my sons birthday and the telescope was great. All the tools were included for setting up the telescope which is a bonus. Setting up was a breeze despite my son cheering me on to set it up quicker. Didn't help that the instructions were vague at times. About 15 minutes later, telescope was all set up and ready to go. Pointed at the moon and was quite impressive. We've tried looking at planets, we can just see the rings of saturn on the smaller eyepiece. Will take it with us camping later in the year or possibly up with us when we go skiing to see how its like away from the stars.